What are the key factors that influence your decision when purchasing a mobile phone? Well, smartphone with longest battery life is one the most ones. Ever since we use smartphones as daily driver, we face battery problem everyday. It seems the battery technology is stuck in here without any obvious progress. We haven’t seen a breakthrough in battery life. For most smartphones, they still need to be charged at least once a day or even twice a day. No wonder there are huge demands for power bank. Some companies are working on new battery materials that can boost battery life. Maybe we can say goodbye to power bank. But back to reality, we still need to consider battery life before purchasing a smartphone. What are the criteria to evaluate the battery life of a phone? Screen size, screen type, processor, battery capacity, and system optimization all matters. For example, let look at 7 KXD Mobile smartphone with good battery life and see which one you like best. As a powerful model, KXD Y20 is a large battery phone as well. It is a 3600mAh high density Li-Po battery. And KXD has improved the power-saving technology on Y20, making it last longer than other competitors. KXD Y20 can easily get through a day or even a day and a half. KXD Y20 is a full screen display mobile phone, KXD Y20 follows it and offers a 6-inch 18:9 IPS display with ultra-thin bezel on the left and right. And Y20 has beautiful metal unibody design. It features 3G RAM+32G ROM and a 1.5GHz octa-core processor, which make the phone run faster and smoother. Dual camera and fingerprint scanner are also found on KXD Y20. You can have more ways to unlock the phone. KXD K10 features a 3300mAh high density Li-Po battery, which is not only safer but also more durable. You can easily get through a whole day with KXD K10. The phone also packs with an 18:9 6-inch IPS display, K10 has a screen-to-body ratio up to 87%. The phone is all metal unibody design with incredible craftsmanship. And it come with 3G RAM+32G ROM, which can handle daily operation without any issue. And K10 also provides face ID and fingerprint scanner. KXD K30 packs with a 3000mAh high-density Li-Po battery. It is not a large battery but KXD optimized the power-consumption strategy and K30 can last for 11 days of standby, 16 hours of talk time, and 120 hours of music playback. In this case, battery capacity is not the decisive element. This is a very beautiful phone with amazing design. KXD K30, like most flagship phones today, is made of dual glass and metal frame. The phone has 2 magnificent colors—mystical black and burning red. And there are 2.5D Corning Gorilla Glass 5 on the front and back. The glass color will change according to different environment. KXD K30 features a slightly smaller 5.7 inch IPS display with RawColor technology. The battery on KXD T55 is only 2500mAh. But thanks to low resolution and low power-consumption processor and system optimization, T55 can still manage to get through a day under normal use. KXD T55 is a mid-range full screen phone, which has super high cost performance. It features a 5.5-inch 18:9 IPS display with 85% screen-to-body ratio and Raw Color display enhancement technology. And KXD T55 is built with aluminum material which can prevent fingerprint and grease. Moreover, KXD T55 comes with the most popular face recognition system and fingerprint scanner. The battery on T50 is only 2000mAh. But it is one of the Best 5 inch Screen Smartphone, less powerful processor and better system optimization. KXD T50 is a lite version of KXD T55. But it still keeps the key features from KXD T55. For example, even for an entry-level phone, KXD T50 still features dual camera, face ID and fingerprint scanner. T50 has an 18:9 5-inch full screen with a special designed interactive mode. KXD T50 is very suitable for people who prefer smaller screen. And with SC9832E quad-core processor, T50 supports 4G LTE network and can handle daily tasks without pressure. KXD W55 has a 2500mAh high-density Li-Po battery which can satisfy a day of basic operation. Not all people pursue high-end phones. There is a huge market for entry-level phones too. KXD W55 is a large-screen phone with low price. It has a 5.5-inch 16:9 IPS display with slim bezel and RawColor technology. And there is metallic brush on the back to make the phone more stylish. With 4 available colors, W55 offers more choices for different people. This is the lite version of KXD W55. The battery is 2100mAh, but W50 has smaller screen and low power-consumption processor. It features a smaller 5-inch IPS display. And the same 8MP rear camera and 5MP front camera. With smaller size, you can easily use KXD W50 with one hand. And it brings an incredible speaker. It is significantly bigger and louder than normal smartphone speakers. KXD W50 also provides 4 colors for different people. Above all, these are the 7 large battery mobile phone models from KXD. They have different specs and battery capacity. There are many factors concerning battery life. For most of the time, high performance and long battery life are not compatible. People always need to make compromise until the day we see breakthrough in battery industry, by the way, if you want to get mobile accessories, you can also shop here. 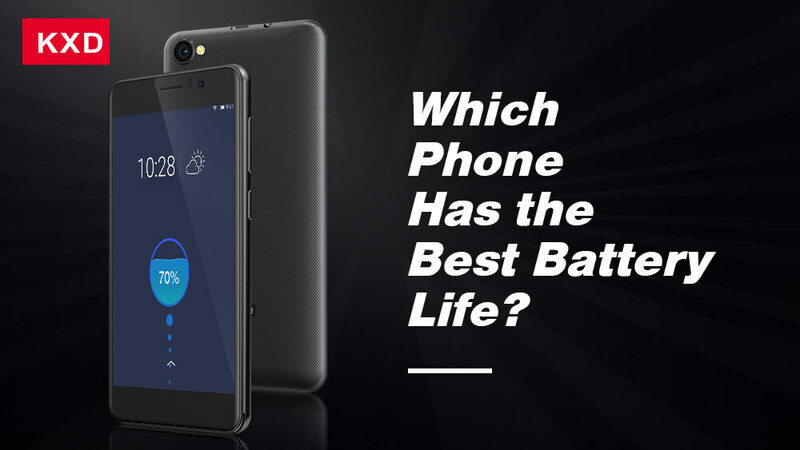 So which KXD phone do you think has the best battery life? If you want to buy a KXD smartphone, you can also check or buy the KXD long battery life mobile phone price list at our “where to buy” page or contact us. Previous PostKXD K30 hands-on: 13MP+5MP dual rear cameraNext PostKXD 6A first expression – better than ever!